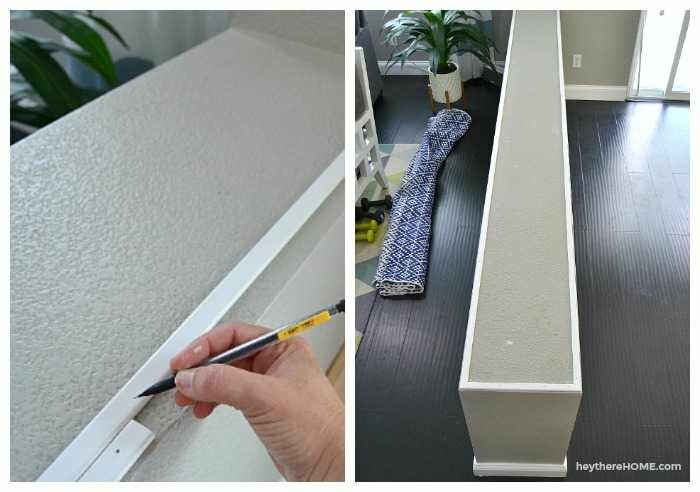 Inside: How to cap a half wall with wood in a few easy steps that will give you a clean, modern look. The half wall that divides our kitchen and family room is one of those things that’s both a blessing and a curse. I like how it separates the two spaces while keeping the open feel but until we capped it it always looked dirty because the top of it was just drywall with orange peel texture — the same as our walls, and those little bumps collected dust. 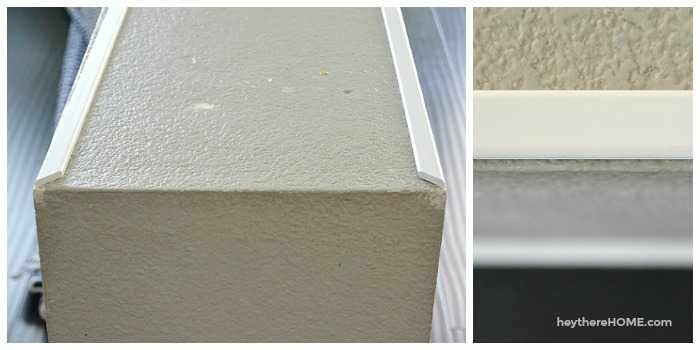 Capping the half wall was on our to-do list for a really long time and it wasn’t until we were perusing model homes recently that I noticed a capped half wall that was done in a really modern way. So naturally I inspected it closely, took some mental notes, and came home to figure out how we could get the same look on our half wall. And it turned out to be so much easier than I thought it would be! –We should have done this project years ago! As I mentioned this half wall always looked dirty because the texture on it was hard to wipe clean. Beyond that, it looked unfinished — forgotten. 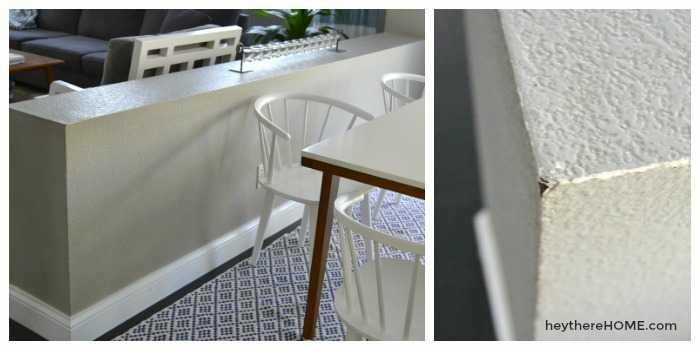 We considered capping this pony wall with the same white quartz that we used on our kitchen island and in the kid’s bathroom, but it would have been hundreds of dollars, so capping the half wall with wood was a better financial choice for us. 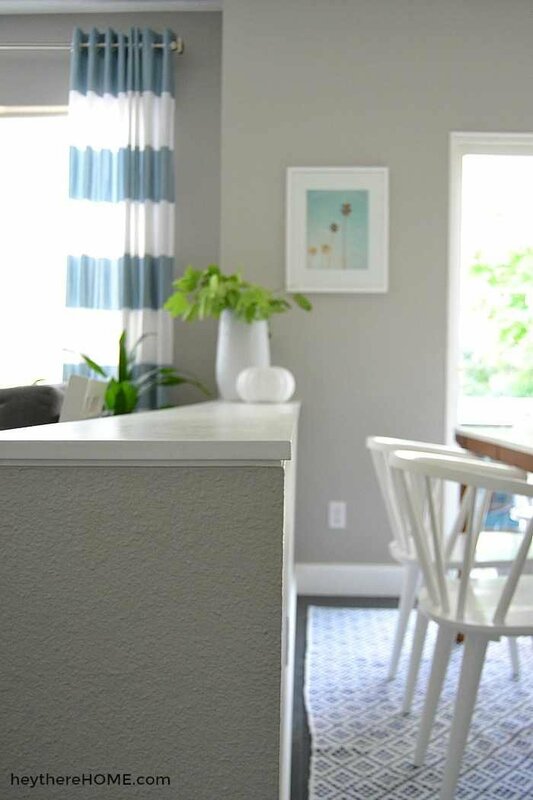 The wood cap on the half wall gives it a finished look and the painted surface is easy to wipe clean. you’ll need a board that is the width of your half wall + 1/2 inch for a little overhang. I had my board cut at Home Depot to make it easy. Since there wasn’t a board long enough I did have to put two pieces of board down along the top and have one barely noticeable seam. 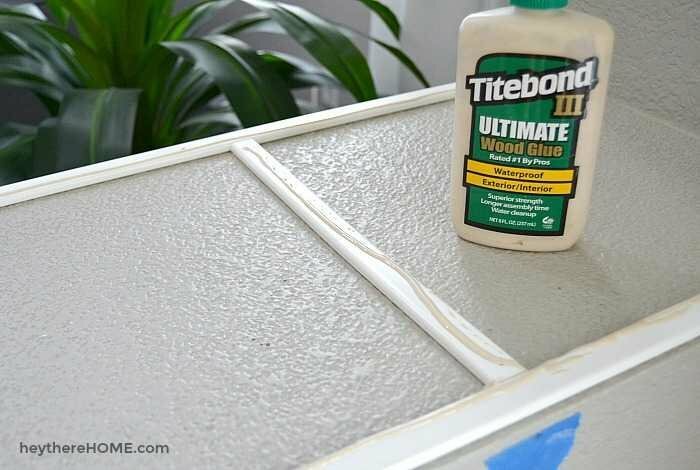 you’ll want to use gloss or high gloss so that your surface is wipeable and won’t collect any dust. this is an additive you can put in your paint to make brush marks less noticeable. I wanted the edges of my half wall cap to be slightly rounded so I took a piece of sand paper and wrapped it around the edges when sanding to give it a nice edge. 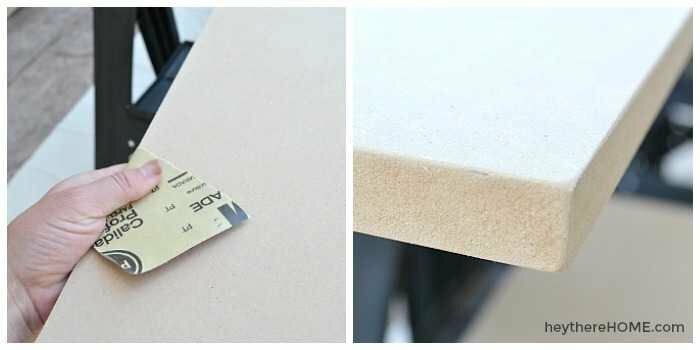 You’ll also want to sand the top of the MDF so it’s very smooth. **The smoother surface you start with the easier it will be to get a smooth finished surface. Once you’ve sanded, wipe it clean with a damp paper towel to remove any dust. 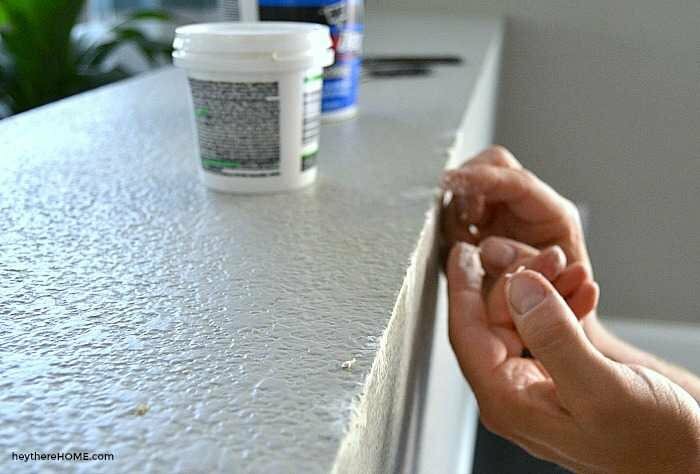 Apply your paint with a sponge roller letting each coat dry completely. Lightly sand and wipe clean between each coat of paint. I applied three coats to give it a nice smooth long lasting surface. Step 1: Prepare your surface. We had a lot of nicks and dings along the edges of the half wall, so we patched them up with a little drywall spackle and touched up the paint so that when we added our cap these blemishes wouldn’t show. Cut a 45 degree edge at the end of each molding piece that will lay on a corner. 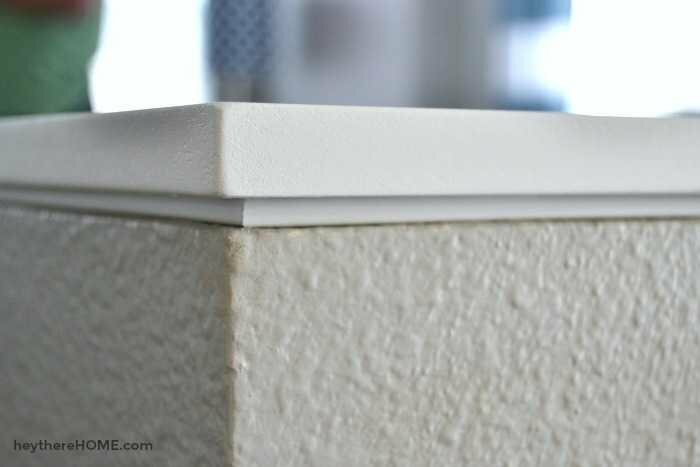 Lay your flat molding just slightly off the edge of the top of your half wall. Then secure with finishing nails to hold it in place. If your first piece isn’t long enough, lay another piece along the wall and mark the remaining section. Cut the extra piece with a straight cut and attach with finishing nails. Our half wall is 14 inches wide; in order to make sure the MDF is supported and to have a place to nail into to keep it in place, we attached a few extra pieces of molding across the top of our half wall. We also marked where each cross piece was placed with a piece of blue painter’s tape so we’d know where to nail later. Bring your board(s) close to where they’ll be placed. Run a line of wood glue along the molding pieces. Place your board so that it hangs over the half wall evenly on all sides. Then using finishing nails, nail the board in place along the center pieces. You’ll know where they are from the blue tape marks you made. Step 5: Patch the nail holes and caulk the seams. 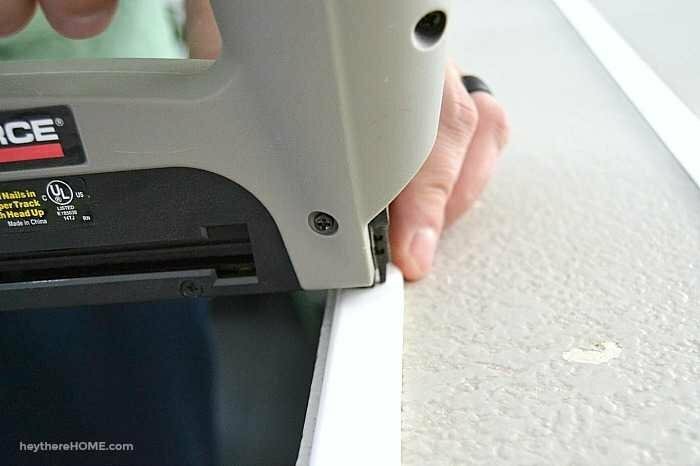 You’ll want to patch the nail holes and any top seam you may have, sand it smooth, and touch up with a final coat of paint. 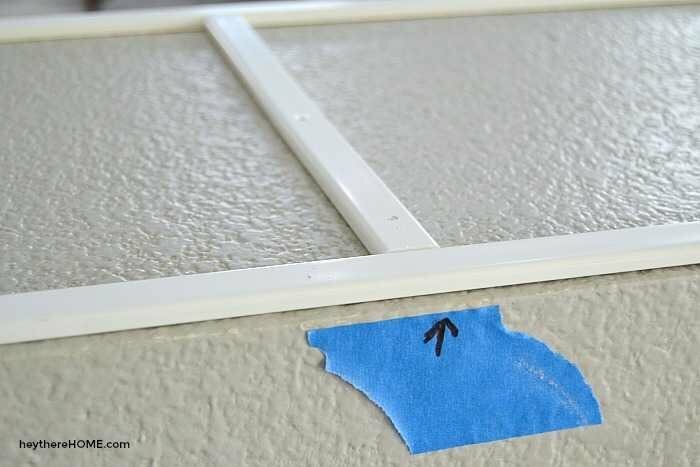 Then run a thin line of caulk along all the seams, dip your finger in water and run it along the same line to smooth out the caulk. 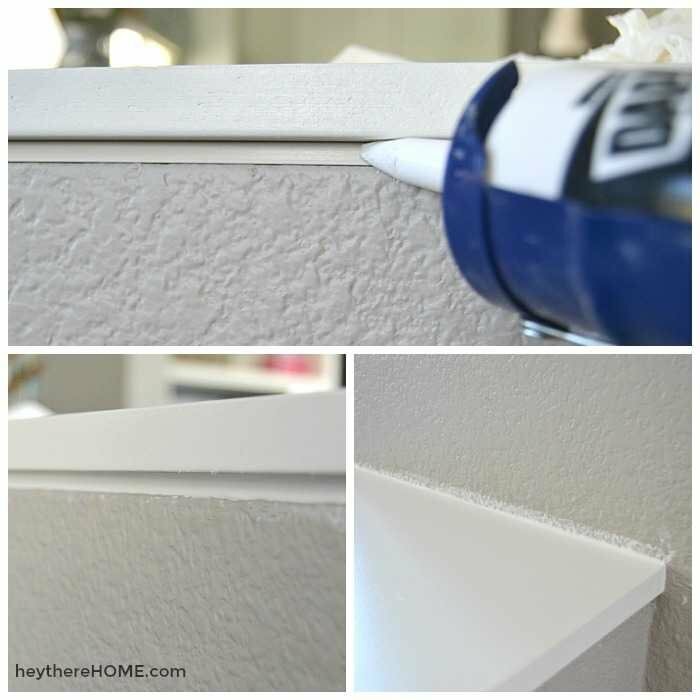 Let the caulk dry completely before doing any touch up to your wall or wood cap paint. 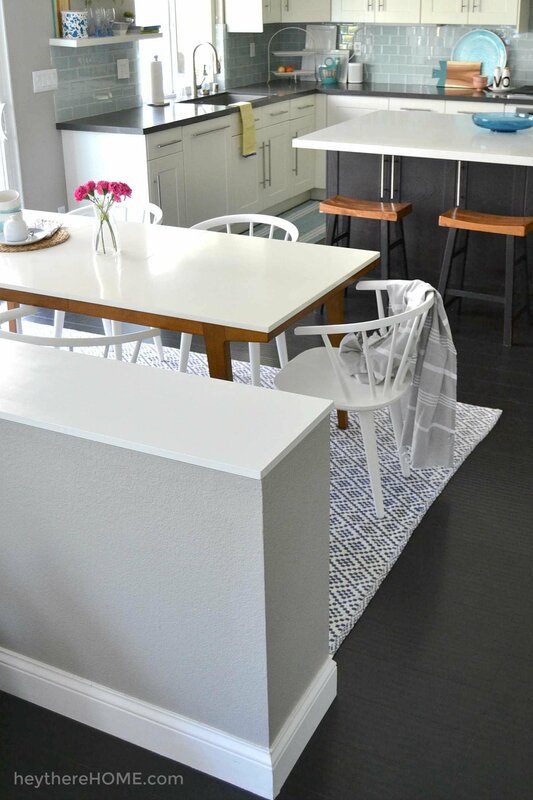 The way this simple project has made this entire space feel more finished is amazing. It’s crazy how just adding the white painted wood surface to the top of our half wall has added character and a bit of a custom look to our home. Quick question, what is the need for the thin pieces that run under it? Why wouldn’t you just lay the main piece straight on the wall? Thanks! Hey Christine, great question! The thin piece adds a nice little detail and makes it look finished and a little more substantial. This looks great! I also love your table,where did you get it? Thanks, Sally. The table is from West Elm. I love it too! 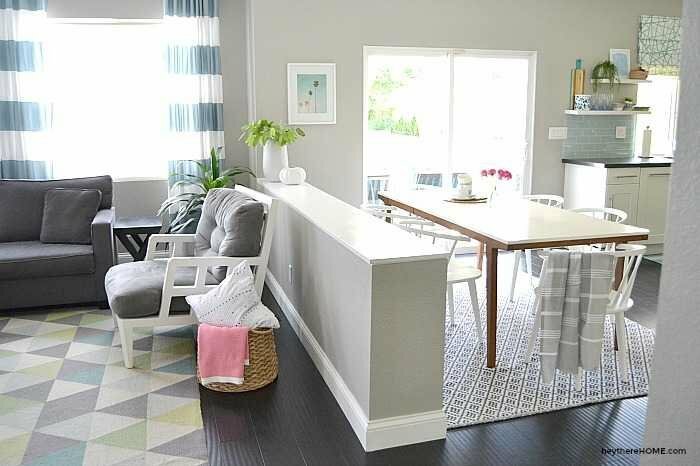 Out of curiosity, why not turn the half wall into a bookcase, cabinets or some type of storage? Hey Nancy! That would be a great solution too! But I didn’t want to take on a big drywall project. Plus we don’t need the storage and I wanted to keep it clean and sleek. Wow, that is amazing how that one change ties everything together so well! Love all the how to details you include in your posts. This looks great! Wow, looks awesome! I love the lack of extra molding that makes the “builder basic” version of this look dated. Yours is so much more sleek! Side note: a commonly misspelled word, I think you mean “caulk”, not “calk”. Fixed it!! 🙂 Thanks for the eagle eye! That sure finishes things off. 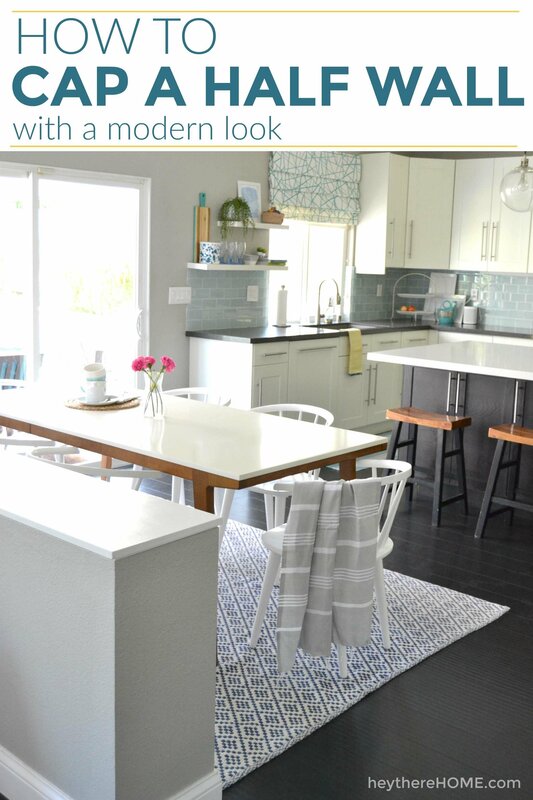 I just love your kitchen and family room! Wow! It looks like it should’ve always been there! I also love your table, simple with classic, elegant lines. 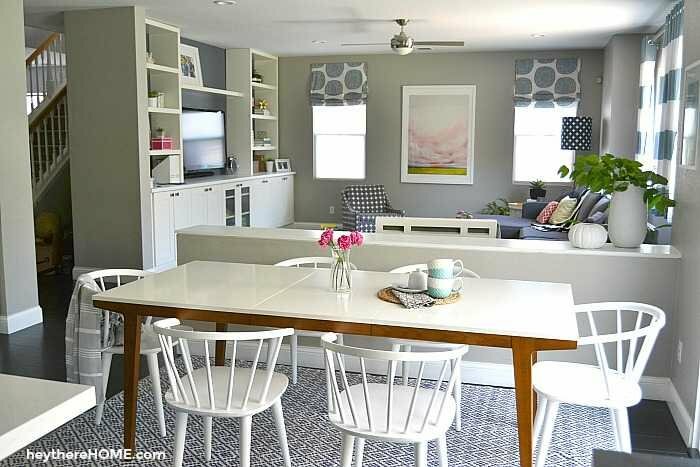 The white counter tops, white table top and now the white cap on the half wall really make the space look very tied together. Your half wall looks great! I also have a half wall that is taller than yours. I enjoy the openness that allows me to visit with family & guests and hides the mess during & after meal prep. Nice! WE did the same thing in our bathroom, and our kitchen, but we used window casing moulding to go under the top. We like it so much better, it just holds up better than sheet rock.